Ugly". Another good example of a public building that fits this category is the George R. Brown convention center in Houston. If you've seen it you know what I mean. However, ugly is only skin deep. Inside, when it in its football configuration, It's a well kept well designed facility. The Alamo Dome was completed in May of 1993 at a cost of $186 million dollars. It opened debt-free and is owned and operated by the City of San Antonio. 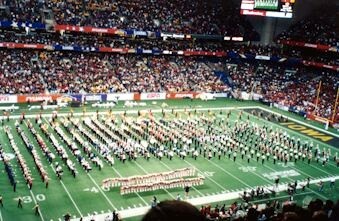 I was at the Alamo Dome this last year to watch the annual playing of the Alamo Bowl. ;It was two 6 and 5 teams (Iowa and Texas Tech) playing in a high scoring game. ; The most exciting thing was the 65,000 people that were there. ; They were entertaining. ; It was fairly cool on this December afternoon and it was easy to tell the fans apart even without the Iowa yellow and the Texas Tech red. ; The Iowa fans were in Iowa tee shirts and the Tech fans were in heavy red coats. ; Oh, by the way Texas Tech lost, but the Tech band won the half time. 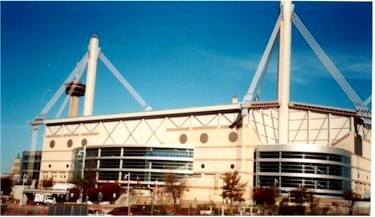 The Alamo Dome also hosts the H.E.B. Classic. ;It features six highly rank Texas High School football teams in three games in one day. ;It has become a pre season Classic. Ever noticed how everything in San Antonio is called Alamo this and Alamo that? ; If you take a look in the San Antonio phone book you would find four pages of "Alamo" listings, including Alamo Dog and Cat Hospital, Alamo Investigation Agency, Alamo Funeral Company, and of course "THE" Alamo: Shrine of Texas Liberty. 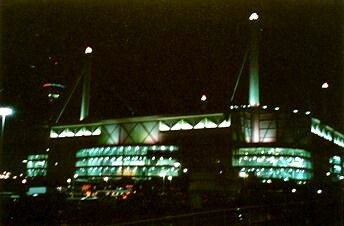 "The Alamo Dome at night"